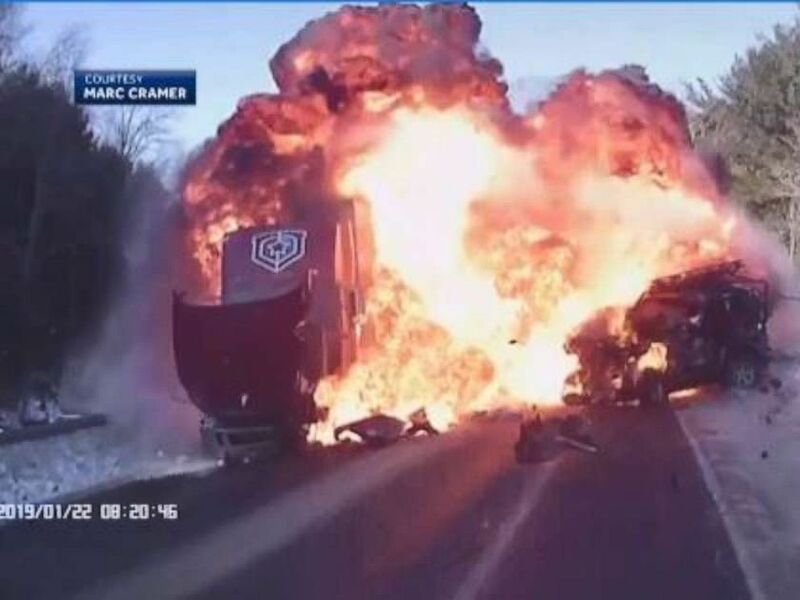 Samuel Lachance appears to veer into oncoming traffic, with his vehicle striking the massive truck and exploding into flames, as seen in dashcam footage obtained by ABC Boston station WCVB. Lachance was taken to Massachusetts General Hospital, according to WCVB. The driver of the semitruck suffered minor injuries. Marc Cramer and his son, John, who were in a third vehicle involved in the crash, pulled Lachance from his burning vehicle. Neither of the Cramers were injured. Marc Cramer's dashcam captured the footage last Tuesday on Route 101 near Dublin, New Hampshire. Samuel Lachance suffered burns, cuts and a traumatic brain injury, but he's expected to recover. "Seeing the video was incredibly shocking," Samuel's mother, Jessica, told WCVB. "I'm glad I saw it after I knew he was well." An 18-year-old man is recovering at the hospital after a head-on collision with a semitruck, which was captured by another vehicle's dashcam.